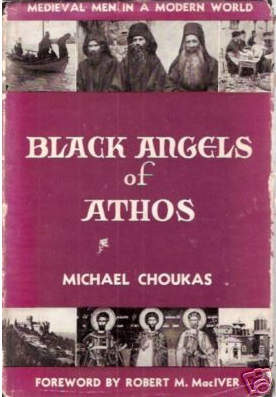 Black Angels of Athos: Medieval Men in a Modern World by Michael Choukas. Foreword by Robert M. MacIver. Description: From the New York Times Book Review in 1935: For more than 1,000 years, bearded, black-robed Greek Orthodox monks have lived in theocratic communities on that marble crag, Mount Athos, which rises 6,000 ft. out of the Aegean Sea. Accessible to male visitors, the monks are used to being asked: “What is the purpose of your life?” They invariably reply: “What is the purpose of your life outside?” Few years ago Mount Athos had a visitor who did more than ask about purposes. A Dartmouth sociologist named Michael Choukas, he viewed the “holy mountain” as a medieval hangover, a laboratory for pure sociological research. He lived among the monks, studied their life, wrote a book. See also our long list of books here. This entry was posted in books and tagged angels. Bookmark the permalink. I have looked at the book a number of times, but have never read it in its entirety. Although I have never been to Mount Athos, one of my professors was a novice at Simonpetra and speaks highly of the spiritual witness of his late abbot and spiritual father. From this and other considerations I suspect that in many ways Choukas’s book is probably a dated portrayal of monastic life on Mount Athos. After all, vistitors to Mount Athos are much more common than they were in the 1970’s and a number of the monks and monasteries of the Holy Mountain now have websites. So I don’t think it fair to regard Mt. Athos simply as a final refuge for those men who can not fit or function in the modern world.